Cost effective concrete filled blow moulded fence feet. Manufactured to the highest standards. High visibility orange reduces tripping hazard and increases public safety. Fast installation and extremely sturdy. Fortress Fencing’s plastic moulded temp fence feet are filled with concrete for a sturdy and robust finish. They are an ideal solution to complement any temporary fencing application including construction fencing, demolition sites, domestic renovations and events. Fortress Fencing’s blow moulded fence feet are manufactured to the highest standards. 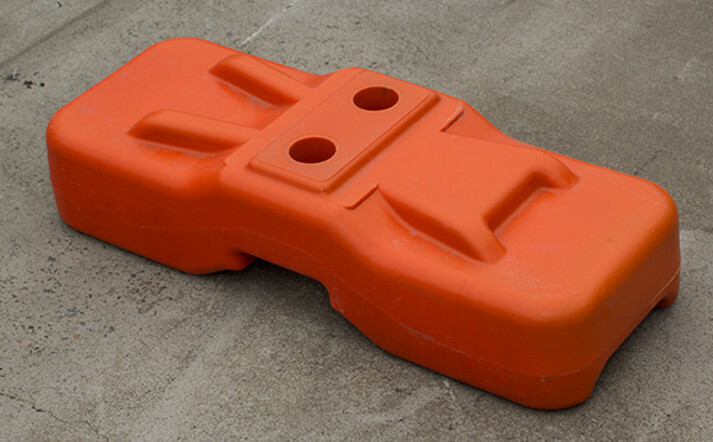 The high visibility orange plastic shell filled with concrete, creates a heavy 25kg weight to pin down your temp fence. The concrete feet hold fencing securely in place, increasing public and worker safety. The bright orange shell is highly visible, reducing tripping hazards. They feature either a 33mm or 40mm hole allowing for fast installation of temp fence panels and are extremely sturdy. WHY DO I NEED FENCE FEET? Temporary fencing panels from Fortress Fencing require the inclusion of fence feet to enable a successful install. Although we provide temporary fencing in package lots which include feet, we also have temp fence panels available for sale individually. If you’re looking at purchasing a custom length of fence panels that isn’t part of a package, you will need to add either Polyblok or concrete fence feet. Each fence foot has two holes and therefore supports two temp fence panels (when the foot is positioned in the centre).